In the previous post, we discussed the overview and the architecture of VMware Site Recovery Manager (SRM 6.5) and today we will look at the installation of VMware Site Recovery Manager software. Before we proceed any further, we will first make sure that we meet all the prerequisites so that we don’t hit any roadblocks at a later time. Install the appropriate version of Platform Services Controller and vCenter Server on both sites. You cannot mix Site Recovery Manager, Platform Services Controller, or vCenter Server versions across sites. For environments with a small number of virtual machines to protect, you can run Site Recovery Manager Server and vCenter Server on the same system. When you install and configure Platform Services Controller, vCenter Server, and vSphere Replication, use fully qualified domain names (FQDN) whenever possible rather than IP addresses. Obtain the address of the Platform Services Controller instance for both sites. The Platform Services Controller must be running and accessible during Site Recovery Manager installation. Obtain the vCenter Single Sign-On administrator username and password for both of the local and remote sites. Synchronize the clock settings of the systems on which Platform Services Controller, vCenter Server, and Site Recovery Manager Server run. Obtain the username and password for the Site Recovery Manager database, if you are not using the embedded database. In our case, we will be installing Embedded vPostgres Database. If you do not use the embedded Site Recovery Manager database, Site Recovery Manager requires a database source name (DSN) for 64-bit open database connectivity (ODBC). You can create the ODBC system DSN before you run the Site Recovery Manager installer, or you can create the DSN during the installation process. To use Site Recovery Manager with vSphere Replication, deploy the appropriate version of vSphere Replication on both of the protected and recovery sites before you install Site Recovery Manager Server. Download the Site Recovery Manager installation file to a folder on the machine on which to install Site Recovery Manager. Once you have downloaded the exe file from the above link, double-click on it to start the Installation Wizard. Follow the installer prompts to accept the license agreement, and verify that you satisfied the installation prerequisites. Enter information about the Platform Services Controller at the site where you are installing Site Recovery Manager and click Next. When prompted, verify the Platform Services Controller certificate and click Accept to accept it. 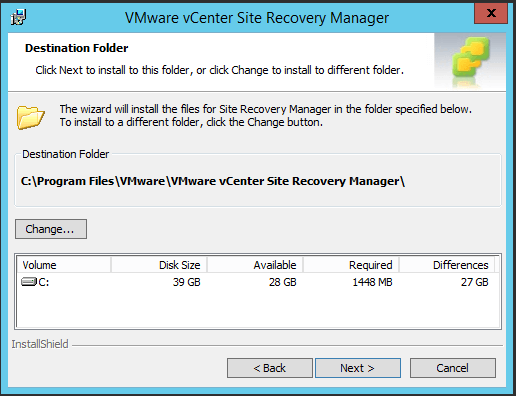 Select the vCenter Server instance with which to register Site Recovery Manager and click Next. When prompted, verify the vCenter Server certificate and click Accept to accept it. Enter information with which to register the Site Recovery Manager extension with vCenter Server, and click Next. Select the default Site Recovery Manager plug-in identifier, or create a plug-in identifier for this Site Recovery Manager Server pair, and click Next. Note: Both Site Recovery Manager Server instances in a site pair must use the same plug-in identifier. Select Automatically generate a certificate and click Next. Enter text values for your organization and organization unit, typically your company name and the name of your group in the company. Select whether to use the embedded database or a custom database and click Next. VMware Site Recovery Manager provides a built-in vPostgres database that you can use with minimal configuration. Provide the Site Recovery Manager database configuration information and click Next. Select the user account under which to run the Site Recovery Manager Server service and click Next. Select Use Local System Account to run the Site Recovery Manager Server service under the Local System account. When the installation is finished, click Finish. Once installation completed and SRM related services are started, Login to your Protected site vCenter Server using vSphere Web Client. You can notice the Site Recovery Icon will start appearing in the Web Client. Repeat all the above steps on the recovery site to install SRM. Once VMware SRM 6.5 installation is completed on the both protected and recovery site.Log inn to vSphere Web Client of both vCenter servers using the web client. Click on “Site Recovery” plug-in. You will be able to see your SRM site names which you specified during the installation under sites in each vCenter server. We have now successfully installed SRM on both sites. In the next post, we will discuss on how to pair the sites and next steps. Adil this is some deadly stuff. I really wanted to continue reading! Thanks for passing on and I have without a doubt learned some ideas.